I read this article and found it very interesting, thought it might be something for you. The article is called Watt Next? Your Complete Guide to Switching Electricity Providers and is located at https://electrify.sg/content/articles/complete-guide-switching-electricity-providers/. With the Open Electricity Market recently launched on 1 November for residents with postal code starting with 58 – 78, we bet you just can’t wait for the day when you can finally say, “Sayonara!” to expensive electricity bills, and ask yourself: “Watt next?” (Sorry, couldn’t resist the pun.) What should you do to make that switch and what should you prepare? Don’t fret, Electrify’s got you covered. We’re here to make sure it’s a smooth sailing journey for you. 1. Head to a comparison site. This is pretty straightforward. Just go to Electrify.sg to start comparing. 2. Tell us who you are and your electricity usage profile. We want to know more about you. Tell us some basic information about yourself and how you consume electricity. We’ll use this information to find the best plans that best suit your need. Once you’re done, just click Submit. 3. Compare and select your preferred plan. Now, sit back and relax! We’ll scout for the best deals. Our electricity search bots are working really hard, and all you have to do is compare and select. 4. Create an account and send us the necessary details. Ready to switch? Set up an account so that we know you’re 100% sure about your decision. Then, send us your details for processing. 5. Complete your contract, make a payment, and voila! You’re all set. You’re just one final step away from saving up to 20%. After you’ve made your choice, complete your contract by uploading all the necessary documents and submit a payment online. Once done, your new electricity supplier will process the switch; you don’t even need to move a muscle! With the money you’re about to save every month, it’s time to finally put it to good use and do something you love! Like travelling, or simply pampering yourself to a well-deserved facial and spa. Whatever it is, make sure you come back more radiant and vibrant than ever. 1. Will there be any electricity disruption when I switch providers? No. Electricity is delivered to you through the national power grid, operated by SP Group. Retailers and SP Services buy electricity in bulk from the wholesale electricity market to supply to you. That means changes are purely administrative, and you will continue to enjoy the same quality of electricity supply. 2. Does my contract start immediately after I confirm the switch? No. Usually, the entire process takes about 2 weeks, during which your new supplier will contact your old supplier and agree on a switchover date. Rest assured, you will continue receiving electricity during this process, as mentioned above. 3. Will I be billed twice? No. Your suppliers will agree on a switchover date and settle with each other accordingly, making the process as seamless for you as possible. 4. Can I switch suppliers once my contract starts, if I’m not happy with the plan I’ve selected? We do not recommend you switch before your contract is up, but if you absolutely have to, check the termination clauses with your retailer. Usually, there will be some penalty charges that you’re required to pay in order to terminate the contract. Have any other concerns that we missed out? Talk to us at [email protected]. Otherwise, what are you waiting for? Start comparing and saving with Electrify now! 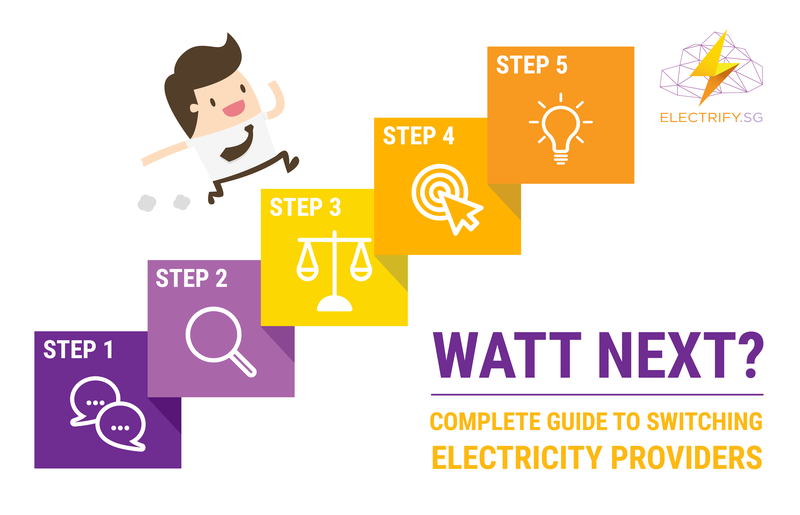 We are Singapore’s first retail electricity marketplace to help household and business consumers find and contract the best energy plans more easily. Visit ELECTRIFY.SG now for more details.